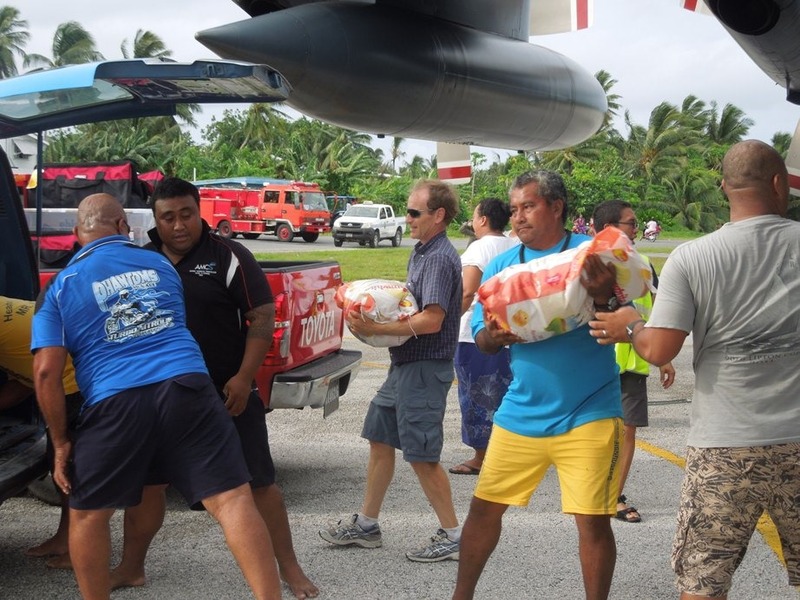 The Government of Tuvalu established a National Disaster Committee to oversee the cyclone response effort. They also created a donor’s sub-committee that we participated in with the other international donor partners: Australia and New Zealand are key donor partners of Tuvalu and sent in staff from Suva; the UN, Red Cross, South Pacific Commission, UNICEF and others were all there. 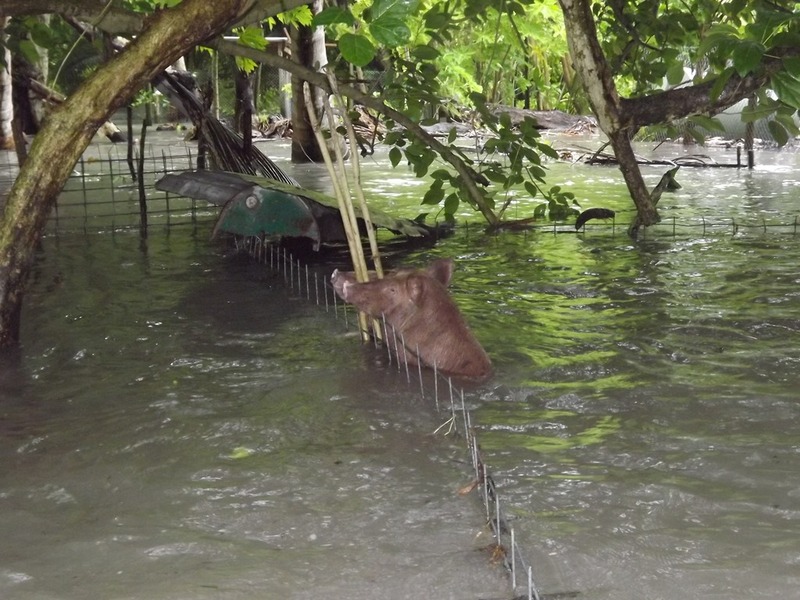 The South Pacific Commission team of Peter and Joy helped to collect information from the Government’s ‘Rapid Assessment Teams’ (RATs), and to get a GIS setup for helping to identify the scale of the disaster and where support was needed. Peter and Willy—from Australia and New Zealand—focused on mobilizing logistical support, and liaising with the Government. They prepared daily ‘Situation Reports’ summarizing the information which was available, and the various responses. Patrick and Stewart were mobilized by Australia to support the effort. Patrick was an experienced ‘Water and Sanitation/Health’ engineer who had a lot of experience and was quite sensible. Stewart was a disaster logistics specialist who was also skilled in assessments. Ash was a Commander in the Australian Navy stationed in Tuvalu to help with fisheries protection. He did an amazing job of organizing and supporting the effort. Nora and I agreed to lead the work in doing a ‘Damage Loss Assessment’ (DaLA). This is important—especially for the World Bank—as depending upon the scale of the disaster (i.e. if > 10% of GDP) additional resources could be mobilized by the Bank. The remoteness of Tuvalu represented a real challenge to the disaster. Not only is Tuvalu remote, but the islands hit by the storm were the remote part of Tuvalu. Tuvalu’s domestic ships are not the most reliable, and unfortunately Tuvalu’s fisheries patrol vessel was out of action with some broken parts. 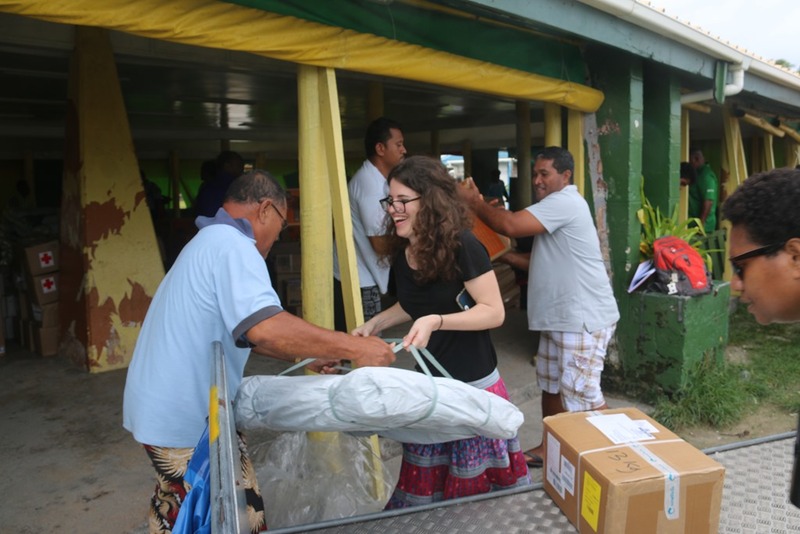 Samoa kindly agreed to assist by sending up their vessel, which the Red Cross loaded with all the emergency medical supplies available in their stores in Samoa. To compound the situation, the weather continued to be very challenging. There was a strong westerly wind which resulted in very large swells. 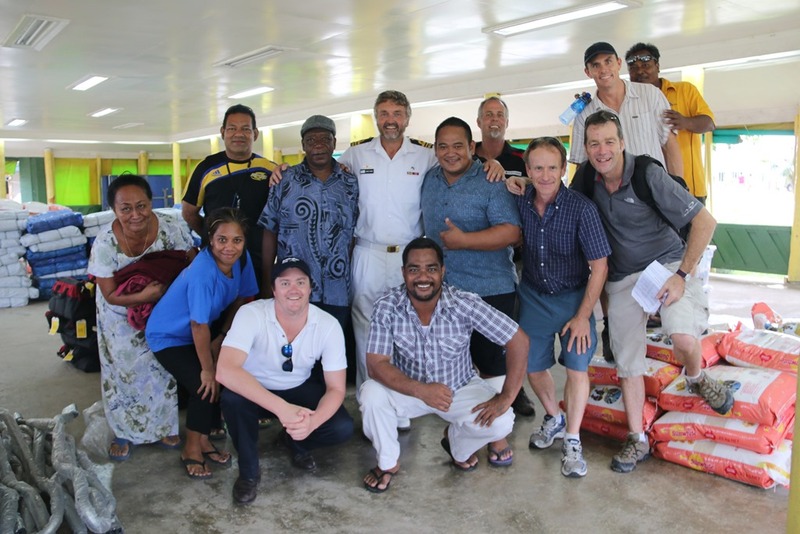 It was so rough that when the Samoan patrol vessel arrived in Funafuti two of the sailors had to be hospitalized with the effects of sea sickness. And these are Polynesians who are among the world’s greatest sailors. The plan was to send the vessel to the central islands. Initially a number of donors volunteered to head up but I declined as the idea of spending up to five days on a boat for a few hours ashore to do damage assessments was not enticing. Let alone that I didn’t think I had the sea legs for it. In the end Stewart went up and he said it was tough, but the sea sickness pills helped. Ironically, when they returned to Funafuti they could not dock and spent the night outside of harbour being rocked about. The RAT teams collected data on the damages and, importantly, provided a lot of photographs of what happened. There is a standard methodology for doing a DaLA which covers a range of sectors, and normally one mobilizes a large multi-discipline team. In this instance there was myself and Nora. Nora agreed to handle the agricultural and livestock DaLA while I addressed infrastructure. It’s a sign of her versatility (and easy going nature) that she agreed to do this as it is about as far from her training in aviation and logistics as you could get. She undertook some market research on the cost of livestock, fish, etc. (who would have thought that a full grown pig would be worth $300!) and also did research into the types of crops that were grown on the different islands. Using the RAT team reports and photographs, she estimated the levels of damages and losses—an iterative process when we found that the assumptions applied resulted in what seemed to be unreasonable numbers. Our view was that we should adopt a very conservative approach since if this met the Bank’s threshold for additional support then there would be less debate about the numbers. Piggy Hanging On for Life! With regard to infrastructure it was interesting to see how this disaster differed from last year’s Cyclone Ian in Tonga. There is was housing—about 60% of the housing stock—which was most heavily damaged whereas in Tuvalu only some 10% of the houses destroyed. 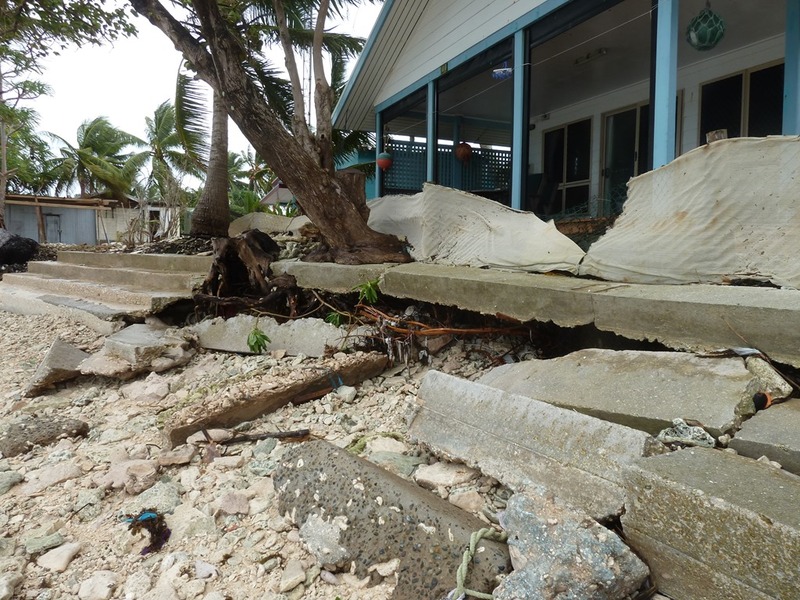 However, there was massive damage to coastal protection—even on Funafuti. What happened was that the storm either trashed the coastal protection or it weakened it and the subsequent week of heavy weather (and a 3.2 m king tide) finished it off. 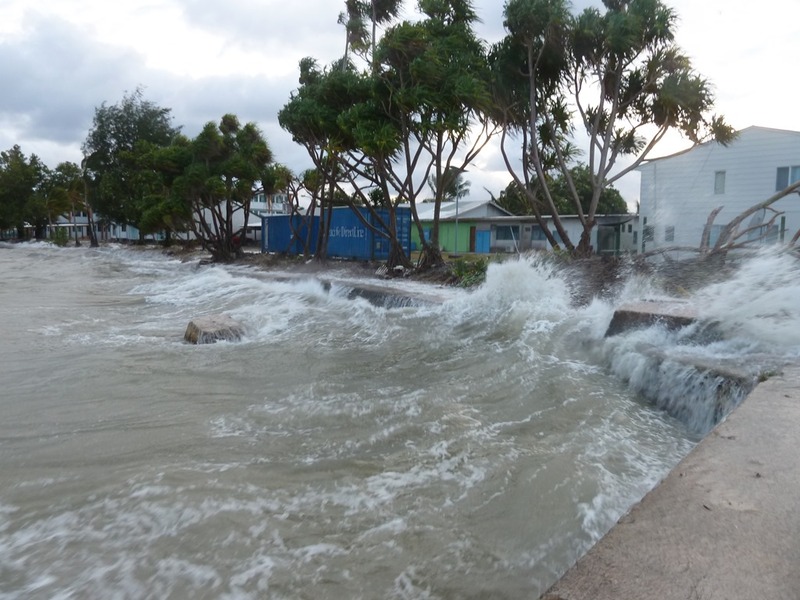 Funafuti Takes a Hammering – A Week After the Cyclone! 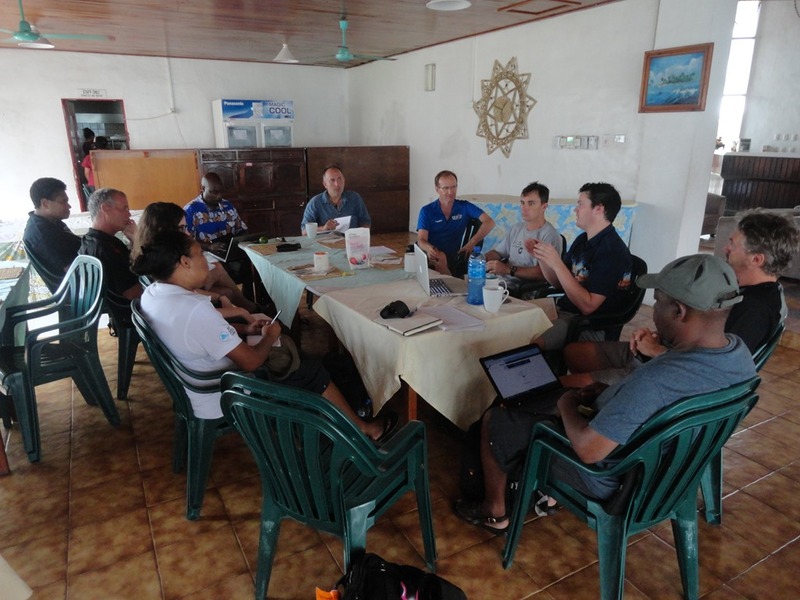 One very refreshing aspect of working in Tuvalu was the way in which they were honest with their needs. When I guessed $50k for repairs to the electricity on one island the power company said that was too much since the wires were below the ground; only $20k was needed. The communications company gave a detailed list of the equipment damaged and the costs—but I had to remind them that they also needed to include the cost of their staff and shipping to the outer islands. This is in contrast to some other countries where donors are seen as an easy mark for getting lots of funds. One of the big problems was a lack of supplies—food, medicines, tools for repairs, etc. With the World’s attention focused on Vanuatu which was much harder hit, Tuvalu was struggling. 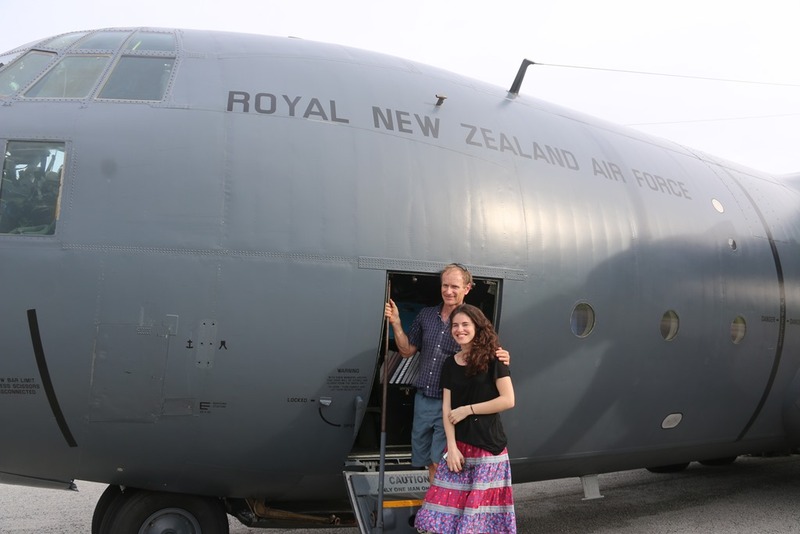 New Zealand came to the table by arranging a C130 to bring up emergency supplies from NZ. They also stopped in Fiji where they collected supplies that had not made it onto the bi-weekly Fiji Airways flights to Tuvalu. The flight arrived at about 15:30 on Sunday and it was a team effort to unload the flight. The Red Cross, the disaster committee, donors and anyone who felt like helping joined in and unloaded the aircraft. As the Prime Minister watched Nora and I unloading the aircraft he quipped to Peter and Willy that it was nice to see the World Bank flexing its muscles. It was great to be able to help in a material way and Nora especially enjoyed the experience—this is the sort of work that she wants to get into in the future (not unloading but disaster logistics!). Here are some photos of the experience. Sealord Fish From Nelson Where I Live in NZ! A Good Use of My New Zealand Tax Dollars! Nora and I flew out on the Tuesday—Nora to D.C. and myself to Australia. In Sydney we had meetings at the Bank to review the DaLA findings and on the basis of this the Bank is looking at options for how to assist Tuvalu with some emergency funding. It was an incredible experience to work with such a great team from the Government, donors and NGOs and I will always be grateful to have been there to help in some small way—even if it included lugging some 25 kg bags of rice! Seeing the international response and support to Tuvalu made me appreciative to be part of the donor community which helps people to get back on their feet again. This entry was posted on Friday, April 3rd, 2015 at 7:17 pm and is filed under Uncategorized. You can follow any responses to this entry through the RSS 2.0 feed. You can leave a response, or trackback from your own site. Well done everyone, a rapid response was needed and you were not found wanting. Sadly I see no evidence of UK ‘s aid involvement despite it being one of HM’s Realms. Perhaps a sign of our times in the Pacific. Yes, that’s a good observation. The UK is not very involved at all in any of the countries I’ve been working on. Nor is the USA. Perhaps they do it through the EU? Must as my friends at DFID what the story it. I do know that they are focusing on Africa since the Bank works a lot with them there. In the end, this is NZ and Australia’s back yard so good to see them helping so much.